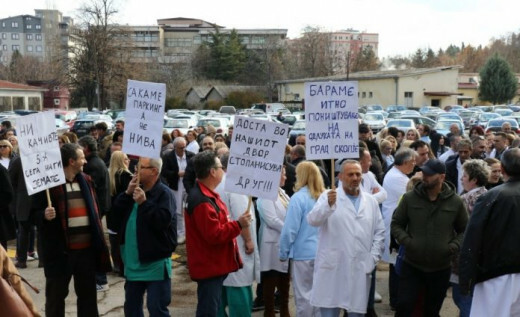 VMRO-DPMNE expressed its support for the doctors from the Skopje Mother Teresa Clinic, who are protesting poor working conditions and the hike in their parking fees. – This Government promised doctors it will increase their salaries to 100.000 denars. Not only they lied about this promise, but even the modest 5 percent increase is now being taken away from them with these additional fees. The doctors were lied to by the pardoned politician running the country and this is why they protest. We will join them and support them, said VMRO-DPMNE leader Hristijan Mickoski during his rally in Veles on Sunday. Mickoski condemned the Zaev Government over its failure to improve the healthcare, which Zaev promised would be his top priority. Zaev’s SDSM party used dramatic and emotional campaign tactics against the previous VMRO-DPMNE Government, frequently citing issues such as infant mortality or making political hay on the deaths of patients. Mickoski said that after taking over the Government, SDSM did not “hammer a single nail in a single healthcare facility”. A major planned expansion of the Mother Teresa Clinic, which was fully prepared by the VMRO-DPMNE Government, was quickly scrapped by the SDSM Government, which is now re-opening the discussion on the site of the future clinic.